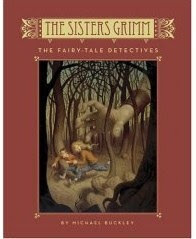 If you like fairy tales and juvenile fiction, read this book. It is a quick read and extremely funny. It is the perfect book for days when you only have a couple of minutes and need a light book that can be read a page at a time. The characters are funny and likeable but most of them are only in the book for a short period of time. The main focus of this book is definitely the story, which is very clean. Sabrina and Daphne Grimm have been in and out of problem foster homes since their parents disappeared a few years earlier. They've been chained to a radiator, locked in a home for two weeks while thei r guardians went on a cruise, and forced to share a home with a woman and her haunted toilet. So when the most eccentric woman yet shows up claiming to be their "dead" grandmother, the girls don't know what to think. Sabrina and Daphne are quickly caught up in the magic of their grandma's world and find themselves helping her investigate a giant crime. But when their grandma disappears it is up to the girls to discover who she really is and how to put things right. Now this one sounds really fun. I think I will try to find it.